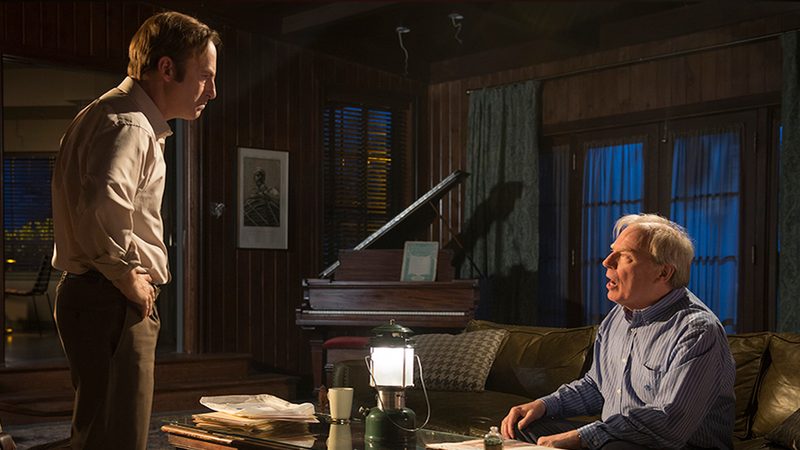 Better Call Saul, the long-gestating Breaking Bad spinoff, premieres this Sunday night on AMC. (A second episode will debut Monday.) No show in my tenure at Grantland has inspired so many readers to reach out with one straightforward question: Is it any good? In the spirit of justice — a concept that Saul Goodman holds dear, though not nearly as dear as his billfold — let me address it right at the top. Yes. It is. Very, very good. But that seemingly simple query is actually just a cover for a more pressing concern, one that has roiled Walter White fans the world over, disrupting more sleep these past few months than a pipeful of Heisenberg’s best blue. When people ask if Better Call Saul is good, what they’re really asking is this: Will Better Call Saul be great? And that, I’m afraid, is a much trickier proposition. Before we consider Saul, let’s consider the spinoff. Once the bedrock of TV empires, it has fallen into disrepair and disrepute of late.1 There was a time when a single popular show could, like a ravenous bacterium, multiply itself exponentially, practically taking over an entire host network in the process. In the ’70s, All in the Family was responsible for seven spinoffs. Happy Days, the Duggar family of prime time, begat a staggering 10. But TV was a very different beast back then. A successful series didn’t need to worry about lofty concepts like “resolution” or “afterlife.” The goal wasn’t necessarily art. The goal was more success. And so, if someone wanted to make a show about an alien crash-landing a flying egg in Colorado, why not have him hang out with Fonzie first? It was a win-win scenario, unless you happened to be the agent representing Henry Winkler’s dignity. The last great spinoff success story was NBC’s Frasier, a series that had the good sense to take the most well-developed secondary character on a classic show and move him across the country into an entirely different context. Frasier worked largely because its creators recognized from the outset that their new project could never be Cheers, so they were never tempted to try. Still, as showered in Emmys as the witty, farcical Frasier was in its time (37 trophies! ), it’s been interesting to note how light the show’s cultural footprint actually turned out to be. These days, comedy writers are far more likely to sing the praises of Cheers than Frasier; if the latter is referenced at all, it’s usually as an elegant footstool to prop up a throwaway joke. I don’t point this out to diminish Frasier’s achievement. (I’m still a sucker for high-class shenanigans at a wine tasting.) But there’s a difference between greatness and very goodness. Both are hard to accomplish on TV. But only one is impossible to forget. As streaming services — not to mention the never-ending tsunami of online debate — have extended the life cycle of a TV series far beyond what God, Mork, or Norman Lear could ever have imagined, the desire to maintain a sort of aesthetic purity has increased as well. Shows are no longer open-ended idea factories. They are complete stories. They have arcs and purpose. They groan with ambition and weight. To tinker with them, even posthumously, would be to risk tarnishing a carefully curated legacy. That’s why, even before the tragic loss of his leading man, there was no way David Chase would have ever considered returning to the world of The Sopranos. That loop had been closed like a Holsten’s onion ring; there was simply nothing more to say. David Simon is far more likely to start trolling Reddit threads than book a return trip to West Baltimore. And Matt Weiner would rather do just about anything, even give credit to his writing staff, than indulge the idea of an ’80s-set Mad Old Men. No matter how many old-fashioneds he’d downed, Don Draper always knew how to make an exit. Which is precisely why it’s natural to look at Better Call Saul with a mixture of hesitation and disdain. We can argue for hours over Breaking Bad’s place on the exalted Mount Rushmore of TV drama, but what is inarguable is the perfection with which it ended. And I’m not even talking about the literal final seconds, in which Walter bled out to the immortal sounds of Badfinger. I mean the fevered addiction that seemed to grip the entire country during those final, fateful weeks in the late summer of 2013. Thanks to the meticulous planning of creator Vince Gilligan, his show ended not with a whimper but with a glorious, collective binge. The shared experience, from recaps to rewatches, was nearly as powerful as the episodes themselves. 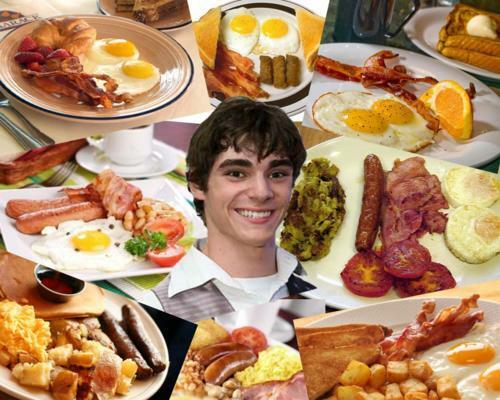 And, unlike every other show from its golden era, Breaking Bad built to a sharp, definitive conclusion. Mr. Chips became Scarface and then was toast. When all was said and done, there were no noticeable loose ends. There were zero half-measures. The only option for a bleary-eyed public was to get clean. But powerful habits aren’t so easy to shake. AMC, a network that has struggled mightily of late in all matters non-zombie, was so eager to chase the Breaking Bad high that it would have accepted any product from the same source, no matter how stepped on. This was cause enough for concern. But then the more I read about the development of Better Call Saul, the more I feared that Gilligan’s involvement — he was cowriting and co-showrunning with Saul‘s creator, Breaking Bad writer Peter Gould — was primarily about altruism, not art. Every interview Gilligan gave was overflowing with mentions of the community Breaking Bad had fostered in the production desert that is Albuquerque, New Mexico. Ending one show meant the termination of hundreds of jobs. Starting another meant the creation of even more. We know Gilligan is cruel enough to imagine Giancarlo Esposito losing half his face, but was he sentimental enough to risk the legacy of his mighty works just to keep the gang together? But then you watch Better Call Saul and you’re reminded of something all too easily forgotten about Gilligan and Gould.2 They are good at this television thing. They are very, very good. Better Call Saul’s pilot is so crisply constructed, so joyfully delivered, that all of my uncertainty quickly went the way of Heisenberg. The first three episodes don’t try to impress. They succeed at something far more important: They entertain. Gilligan and Gould have been at this too long to lose themselves in the expectation game or to waste time worrying about what a series might mean before it’s even begun. Veteran writers both, they know that TV series become themselves over time. Even Breaking Bad wasn’t Breaking Bad at the beginning. It took seasons to build up momentum; happy accidents led to long-term triumph. (Everyone remembers how Aaron Paul’s Jesse Pinkman was meant to die at the end of Season 1, right?) No television show starts perfectly. What matters most is simply starting. Though Jimmy’s Albuquerque is seedier than Walter White’s — just wait till you see his office — it’s instantly recognizable. It feels good to be back on those weirdly wide streets, to lose ourselves on those windy suburban culs-de-sac, to gaze once again into that impossibly big blue sky. Other things are familiar, too: Jonathan Banks is back as the wonderfully sneering fixer Mike Ehrmantraut. (Mike and Jimmy’s meet-cute is particularly well staged.) And, as the episodes pile up, other old friends and enemies begin to reappear.3 (I’m going to refrain from spoilers here not only because AMC asked me to, but also because I want you to have as much fun watching these episodes as I did.) Michael McKean — like Odenkirk, a comic with surprisingly soulful dramatic chops — is in the main cast as Chuck, Jimmy’s older brother, an attorney laid low by health issues. And Michael Mando, the manic Vic from Orphan Black, fits right in as a low-level dealer. None of this would work, of course, without the man in the middle. 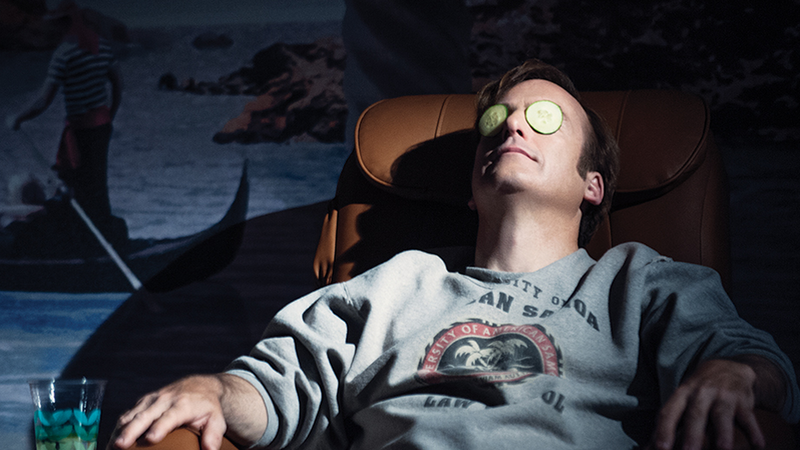 When Odenkirk joined Breaking Bad in Season 2, it was mostly as comic relief. Saul was there to lighten the increasingly dark shadows of a show that would soon plunge straight into the abyss. Of course, the funny thing about comedians is that many of them carry around an emotional abyss of their own. They use jokes the way Saul Goodman uses the Constitution. By the time Huell was lifting ricin cigarettes, Odenkirk had finessed Saul from caricature into character. Now, Odenkirk — who used his downtime wisely, giving a remarkably nuanced performance in FX’s Fargo — gets the chance to rewind the tape and build a preexisting persona carefully, from the ground up. He’s a treat to watch. For every time the corners of Jimmy’s lips begin to curl upward in a facsimile of Saul’s feral smile, there’s a slow, insistent downward tugging on his eyes, as if he can’t quite bring himself to face the squalid reality in which he exists. Luckily for us, it’s a reality in which Gilligan feels right at home. Remember the place where Goodfellas ended? That’s precisely where Gilligan’s art begins. He is the poet laureate of Schnookville. His sonnets ring with stinging banality: the drop ceilings of a municipal courtroom, the buzzy fluorescent lights of a strip mall, the click of a flip phone before the antenna is extended. Jimmy, like Walter White before him, yearns to shake off this emasculating tedium but hasn’t yet found the necessary slipperiness or resolve. To illustrate that journey, just as he did in Breaking Bad,4 Gilligan hones his kitsch until it’s as sharp as a steak knife. By the time Saul’s second episode rolls around, with the brilliant Michelle MacLaren, a.k.a. the Canadian Kali, destroyer of worlds, behind the camera, a recognizable tension fills the screen and the air. Once again there are handcuffed rides out into the desert, once again household tools become objects of uncomfortable violence. The precision of Gilligan and Gould’s storytelling makes the clicking of narrative puzzle pieces indistinguishable from the sound of bullets being loaded into a gun. But let’s be clear: The reason Better Call Saul works is because, similarities aside, it is decidedly not Breaking Bad. There’s more humor here and, so far anyway, a lot less breakfast. While Breaking Bad tracked a genius’s descent, Better Call Saul is primarily concerned with a striver’s climb. There’s a sense of playfulness and fun that isn’t just a welcome break from the meth business; it feels like the blessed antidote to untold hours of grim cable dramatics. I truly appreciate and admire flinty shows like Pivot’s arctic murder mystery Fortitude. But I can’t say I always enjoy watching them. This matters. As viewing options pile up higher than the stack of bills in Walter’s storage space, it’s a relief knowing there’s a series out there like Saul, one expertly designed to provide thrills and good cheer. It’s not rocket science. It’s not even chemistry. But it’s something. Like a good lawyer, Saul is on your side. The term is mostly used now to refer to franchise building, the way JAG leads to NCIS, which leads to NCIS: Los Angeles and NCIS: New Orleans, or comic-book universe-constructing, such as when Arrow begets The Flash and Marvel’s Agents of S.H.I.E.L.D. primes the pump for Agent Carter. Worth noting: Saul’s writers’ room is essentially the same as the one that gathered for Breaking Bad Season 5. The only exception? Emmy winner Moira Walley-Beckett, who is off working on a ballet drama, Flesh and Bone, for Starz. Seeing minor characters get second winds is fun, but I hope Gilligan can resist the part of himself that loves Easter eggs more than a 6-year-old in a Sunday school dress. Let Walter decompose in piece. Let’s not even price out the CGI required to turn Aaron Paul back into a high schooler. Remember Walter’s Pontiac Aztek? Those awful, oversize wooden utensils hanging on the kitchen walls?